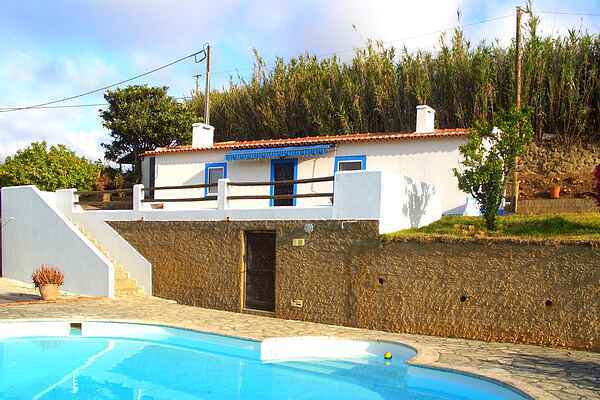 Beautiful, rustic cottage in the province of Mafra, in the parish of Sobreiro. If you can not choose between the countryside, the beaches and the cultural cities then this house is perfect for you: it combines all those holiday options! The friendly owners can give all tourist advice for making nice trips, they live on the same property and have 2 lovely dogs. The cottage is situated in a picturesque hamlet surrounded by a beautiful nature. The beaches and coast are only 8 km away and also the tourist fishing town of Ericeira and the restaurants are close by. Do not forget to visit Mafra during your stay; there is an impressive National Palace and a nice museum of Jose Franco. The capital of Portugal, Lisbon, was of course already on your to-do-list, it is only 45 minutes drive. There are beautiful buildings, pleasant neighborhoods and squares, nice museums, viewpoints, restaurants with the most delicious dishes ... Have fun! What to visit in Mafra: National Palace; Aldeia Típica de José Franco (Typical Village representation); Cerco Garden; Tapada Nacional de Mafra (Natural Park); Manzwine (Vineyard); Malveira Market (local market every Thursday); Ministro dos Santos Sports Complex & Park. Where to eat in Mafra: Adega do Convento Restaurant (typical Portuguese food); Basílica Pastry (fantastic brunch); João da Vila Velha Restaurant (Portuguese food); Fradinho Pastry; Paris Restaurant (traditional food) and 7 Momentos (Coffee & Bakery and light meals) 3 km near the house. What to visit in Ericeira: Santa Marta Church, Santa Marta Park; lovely beaches namely Ribeira d'Ilhas (World Surf Reserve) and Foz do Lizandro (if you travel with children); Board riders Skate Park; Ouriço Night & Sound. Where to eat in Ericeira: Furnas Restaurant (Fresh fish and sea food); César Restaurant (Fresh fish and sea food); Mar das Latas (Tapas); Tik Tak Restaurant (international cuisine - tasteful meat); Tik Tak Tapas; Pedra Dura Pizzeria; Ti Matilde Restaurant (local & sea food); Casa dos Ouriços (Coffee & typical Pastry); Casa Gama (Typical Muffins - the best).